Brian Marz's Fly Fishing Oregon Blog: Orvis Portland Spring Orvis Days - April 13th Don't Miss Out!!! 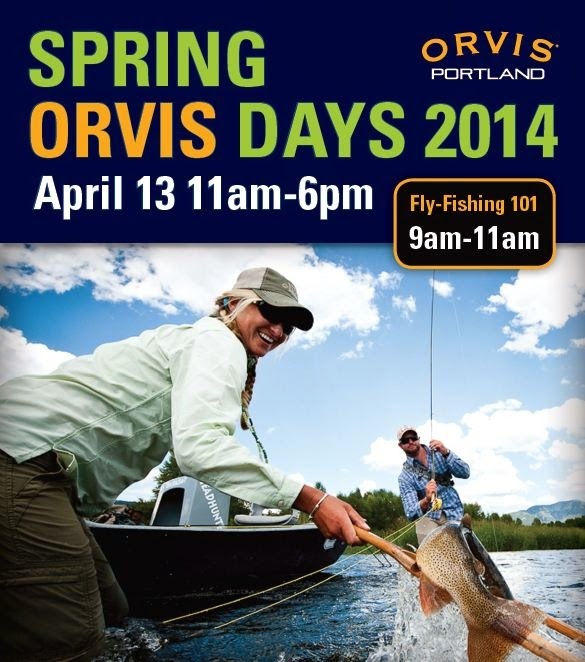 Orvis Portland Spring Orvis Days - April 13th Don't Miss Out!!! Once again I copy and pasted from the Orvis News, but I am sure they won't mind me trying to send more people to the store. Check out this great event, and there are some serious good deals going on as well! Don't miss this opportunity to score on some equipment!! Receive 20% off full-price items – offer good this ONE DAY IN THE SHOP only. 20% off valid at Orvis Portland retail store only. Valid on full-priced items only. Offer not valid on purchase of merchandise at orvis.com, or through the outlet stores, sale events, or catalogs. Not valid with any other promotional offer. Limit one offer per customer. No cash value. Offer valid on merchandise purchases only. Offer not valid on previous purchases. Not valid on sale items. 9-11am: Fly Fishing 101. Learn the fly-fishing basics. 12-1pm: Carp fly-fishing expert John Montana from Carp on the Fly. 12-2pm: Food by Pine Shed Ribs! 2-3pm: Cullen Weisenhunt from Deep Canyon Outfitters explores fishing the upcoming Salmonfly hatch. Questons? Contact Orvis Portland at (503) 598-7680.